A Visit To Triangle Rock Club in Morrisville! My exploring recently took me to a very interesting location with a visit to the Triangle Rock Club (TRC) in Morrisville. 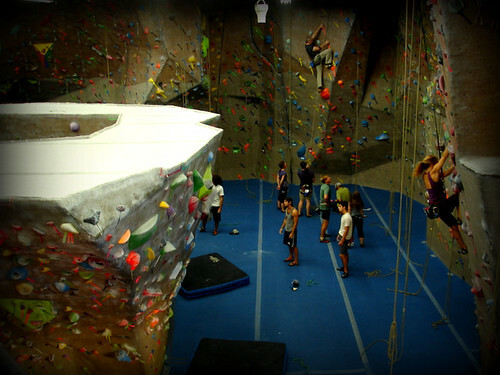 TRC is an impressive state of the art climbing facility that provides instruction and programs for every type of climber, from beginner to expert. They offer day passes and monthly memberships for climbing as well as instructional classes, track out programs for kids, and group events for local businesses and organizations. 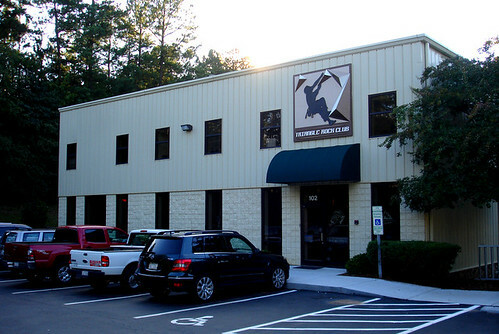 Triangle Rock Club is a 9,000 square foot facility housed within a large warehouse building located in a corporate park just off Morrisville Parkway. Its unassuming exterior doesn’t hint to the exciting and challenging activity bustling inside. It is a unique and quite frankly fascinating facility that ranks way up there on my list of places to check out if you are looking for something to do that is both challenging and different. 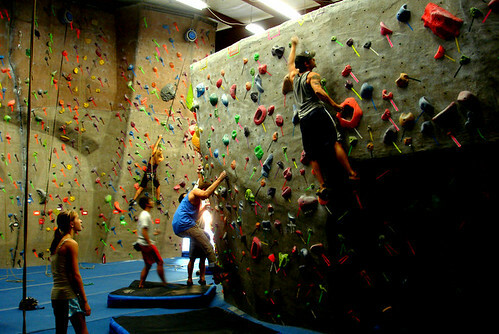 The fully heated and air-conditioned facility features Eldorado climbing walls with 100+ climbing routes and bouldering problems. They have TruBlue auto belays. 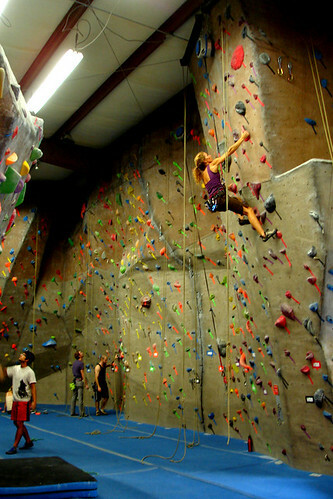 According to the TruBlue website “Traditionally, top rope climbing involves two people – the climber and the belayer. As the climber ascends the wall, the belayer takes up slack in the rope through a belay device. The belayer controls the descent of the climber and is also responsible for applying a braking technique in the event of a fall.” By providing auto belay, TRC eliminates the need for a human belayer allowing for members to do top rope climbing on their own. There is also a large, radical, lead climbing cave for climbers looking for technical climbing challenges. As a person new to the climbing scene I was thrilled to see that TRC is a welcoming place to newbies and veterans alike and provides all climbers a place to learn, grow, and enjoy the sport of climbing. 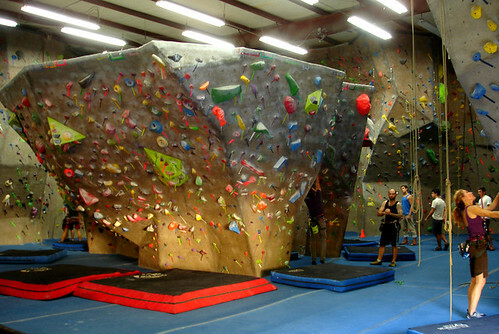 Pictured above is the 14 ft. high, freestanding, top-out boulder with 3000 square feet of bouldering. TRC offers classes for beginners including a two-hour course that provides a comprehensive introduction to safe climbing where you can learn about the facility, the different types of climbing, and the basic climbing concepts and practices. They also host group events and can be rented out for corporate team building events that to teach the skills to overcome the challenges we all find in daily life. In addition to classes and private events, the folks at TRC regularly schedule rock climbing field trips for members to participate in outdoor climbs at climbing destinations throughout the state. Big things are in the works at TRC. 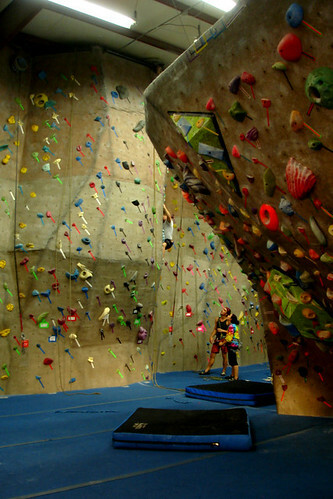 The owners informed me of their plan for a 15,000 sq/ft expansion in 2013 that will include 50′ high climbing walls. As impressive as the facility is already, this expansion will really set the bar high for the local climbing scene. While climbing and bouldering are the main attractions at TRC, members can take a break from their routes and visit the cross-training fitness area complete with strength and cardio equipment. 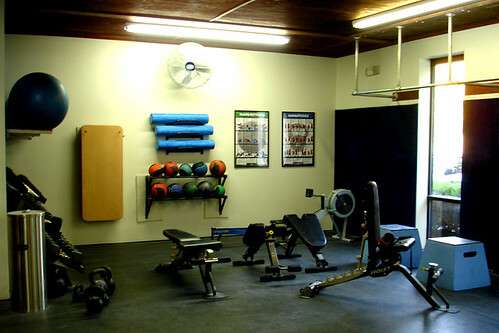 I found the gym to be a nice special touch to the facility. Other ammenities you will find at the club include private party and conference rooms, a gear shop and climbers lounge equipped with HDTV and WiFi. The folks at Triangle Rock Club were extremely friendly and helpful with all my questions. I got the sense they really are passionate about climbing and educating people new to the sport. If you are interested in learning more about membership and their different programs their is a wealth of information located on the TRC wesbite and their FAQ page. They also have one of the best, if not THE BEST, youth climbing team in the Region. They have many nationally ranked young climbers on the team. That is great Beth! I did notice a wide age range of climbers during my visit. It is great to hear the youth climbing team is so accomplished!